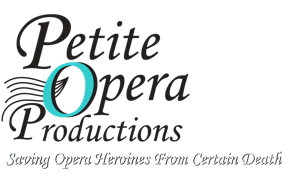 Each Tuesday evening during the month of April, catch Petite Opera Productions on ATT Uverse! Board members Susan Baushke and Steven Arvanites recently appeared on the cable show “Stand By with Marie Conenna”, promoting Petite Opera’s upcoming original spooferetta production, Al Fresco – Life through Opera-Colored Glasses. The opera spoof, which is a cross between opera and improvisation, features famous opera music by Mozart, Puccini and others, in a new story with English lyrics by Petite Opera's founders. The comedy is set in Chicago, and spoofs popular people, events and common--as well as some uncommonly quirky--characters in and around Chicago. Performances take place May 6-7, 13-14, 20-21 at 7:30 PM and May 8, 15, and 22 at 4:00 PM at Mary Wilson House Beyer Auditorium, part of the St. Mary’s Episcopal Church campus, 306 S Prospect, Park Ridge. On “Stand By with Marie Conenna”, the Petite Opera founders discuss how the show came to be, and perform one of the songs from Al Fresco entitled "Hot Dude". The segment airs every Tuesday evening during April (Apr 5, 12, 19, 26) at 7:30 PM on local cable station 19 in Highland Park, Deerfield and Winnetka, IL. ATT Uverse customers viewing outside of these Chicago suburbs can also find it on their cable viewing guide. For those patrons who cannot access either of these cable options, please stay tuned to this site where we will offer the segment via our Petite Opera YouTube channel!